Here's What You So Obviously Need In Your Life: A Kickstand | OhGizmo! By David Ponce on 08/13/13 • Leave a comment! Standing is hard, yo. Why don’t you buy a portable kickstand, and never stand again? 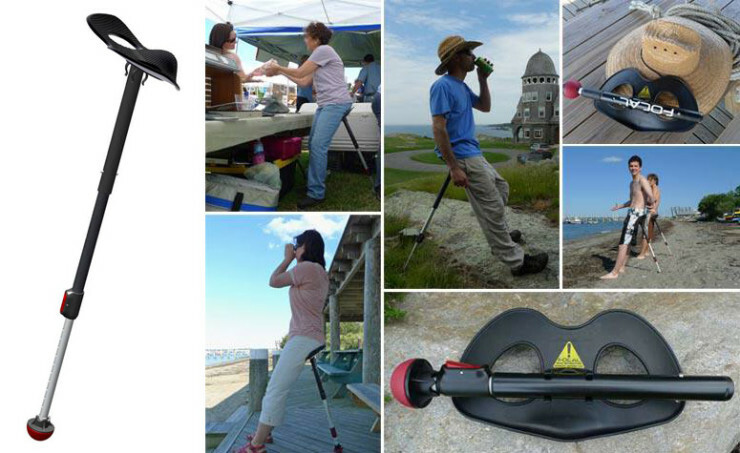 The Mogo is a lightweight, compact, and collapsible aluminum kickstand that can support weights of up to 200lbs. Collapsed, it measures 18″ in length, but extends all the way to 38″. The seat is made from reinforced fiberglass and the rubber base is reversible, and allows for hard or soft surfaces. Weighing in at only 2.1lbs. you can easily bring this with you to festivals, concerts, or even shopping at Walmart… Or whatever other potentially offensively stereotypical place you can think of that could be populated with people who can’t stand for a few minutes. It’s all yours, on pre-order, for $80.